Jules Brenner - Modernist jewelry. 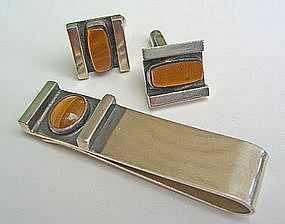 Sterling tie bar and cuff links with tiger eye. Constructed of heavy gauge sterling silver. Tie bar - 2 1/4" x 5/8", cuff links - 5/8" x 5/8".